Pedro Caixinha has been confirmed as the new manager of Rangers after signing a three-year contract. The 46-year-old Portuguese will attend Sunday's Old Firm match against Celtic before starting work on Monday. Under-20s coach Graeme Murty will remain in interim charge for a sixth game since Mark Warburton's departure. "It is a great honour to join Rangers Football Club," said Caixinha after being released by his Qatari club Al-Gharafa on Friday. "This club has a great history and tradition and I am proud to follow in the footsteps of legendary Rangers managers like Walter Smith, Graeme Souness and Jock Wallace. "Rangers is a name that is known worldwide and I am looking forward to forging a positive relationship with supporters and meeting the playing squad and staff at the club. "I know there is a lot of hard work ahead and I assure all our fans that I will do all I can to provide a winning and entertaining Rangers team." 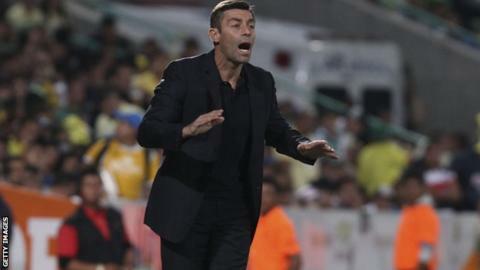 Caixinha previously managed Uniao Leiria and Nacional in Portugal, and led Mexican side Santos Laguna to the 2014 Copa MX Apertura trophy, the 2015 Liga MX Clausura title and the 2015 Campeon de Campeones trophy, as well as the 2013 Concacaf Champions League final. Before moving into management, he spent six years as assistant to Jose Peseiro at Sporting Lisbon, Saudi Arabian side Al-Hilal, Greek outfit Panathinaikos, Rapid Bucharest in Romania and the Saudi Arabia national team. "We are delighted to welcome Pedro to Rangers," said managing director Stewart Robertson. "We compiled a shortlist of high-quality candidates for the position but we knew after our initial meeting with Pedro that he was the right man to take this club forward. "He is a man of great experience and authority and the board has no doubt he will help us achieve our long-term goals. I would like to thank the Rangers supporters for their patience throughout the process but we were determined to appoint the best candidate possible. "I would also like to thank Graeme Murty for taking control of the first team. He will complete his duties at Celtic Park on Sunday before returning to his role with the Under-20s and Pedro will begin his work on Monday morning." Murty has overseen Scottish Cup wins against Greenock Morton and Hamilton Academical, and a Premiership victory over St Johnstone, but league defeats by Dundee and Inverness Caledonian Thistle. Warburton, who led Rangers to promotion by winning last season's Scottish Championship, parted company with the club at the same time as assistant David Weir and head of recruitment Frank McParland. McParland has since become director of football at Nottingham Forest.